While worthy of its affiliation with the National Sailing Hall of Fame, the Alberg 30 is very much the affordable family boat of the future. Whether you seek competitive one design racing or a boat that can take you anywhere in the world, you need look no further. These boats have strong bones. You can buy a fifty-year-old Alberg today and be passing that same boat to your children fifty years from now. If you take care of her, she will take care of you. In fact, she will outlast you. Join us, the young at heart of all ages, the Chesapeake Bay Alberg 30 One-Design Association. The Chesapeake Bay Alberg 30 One-Design Association held a 50-year celebration at the National Sailing Hall of Fame at the Annapolis City dock in 2014. The event included a parade around the harbor on Saturday and an “old-timers” race on Sunday. 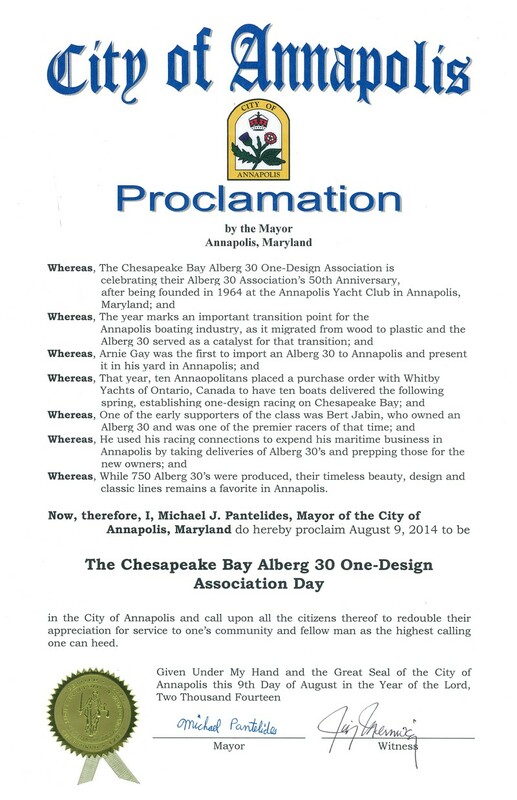 The Mayor of Annapolis proclaimed August 9, 2014 as “The Chesapeake Bay Alberg 30 One-Design Association Day. In 1964, two Annapolis sailors, Jack Martin and Rolph Townshend, saw the first Alberg 30 delivered from Whitby Boat works in Canada to Arnie Gay’s Yacht Yard. They felt the Alberg 30 was the perfect boat to create a cruising/racing one-design association on the Chesapeake. They quickly struck a deal with Arnie to purchase 10 boats for a sum of $100,000, an impressive amount of money in 1964. So began the Chesapeake Bay Alberg 30 One-Design Association and the long-term love affair with the Alberg 30 in Annapolis. In 2016, the Chesapeake Bay Alberg 30 One-Design Association became a founding member of the National Sailing Hall of Fame. Our individual members rose to the challenge during a membership fund drive late in 2016 to accomplish this generous donation. Considering that we are a small, local, one-design sailing organization, this achievement is significant, since it represents more than half of the annual operating budget of our entire Association. Two weeks after the initial 10 boats were ordered in 1964, there were ten sailors eager to begin the fiberglass large boat one-design racing fleet. The Chesapeake Bay Yacht Racing Association (CBYRA) gave the fleet a provisional sanction for racing as a one-design class that year and in 1966, with the A30s boasting the largest one-design fleet in the area, they were given active sanction and the racing was solidly in place. It was not uncommon to find as many as 30 Alberg 30s on the starting line on the AYC Fall Series. In 1965, the International Team races began on the Chesapeake against the Great Lakes Alberg Association. Also, in 1968, The Syronelle Regatta began in Toronto as a reciprocating racing event in which the Chesapeake Alberg Association sends racing teams to compete on Lake Ontario. Both annual events continue to this day. The Alberg 30 was one of the first classes to join the Annapolis Yacht Club Wednesday Night Races. You can still find many Albergs racing in this event today. While there have been four circumnavigations (all single-handed) and numerous blue-water cruises on Alberg 30s, most of the cruising in the Chesapeake Bay Alberg 30 One-Design Association is on the home-waters of the Chesapeake. The cruising schedule is jam packed with weekend cruises, a 2-week summer cruise and a very popular week-long fall cruise called “The Wild Goose Chase.” Point-to-Point races often coincide with a cruise destination that allows families to race together and enjoy the pleasure of rafting up with fellow Alberg cruisers. It is often said “you are not just buying a boat, you are joining a family.” Life-long friendships (and marriages) have developed through the Chesapeake Bay Alberg 30 One-Design Association. We hold many events each year that helps us stay in touch with each other. Our publications like our monthly newsletter, the Mainsheet, our annual handbook, our winter educational seminars, and our online forums such as our public forum… http://lists.alberg30.org/listinfo.cgi/public-list-alberg30.org , tell us about upcoming events and provide tips for keeping these old boats sailing. The Mantoloking Yacht Club on Barnegat Bay was started in 1907 for outdoor sports and social activities for summer residents and guests . Mantoloking Yacht Club is thrilled to be a founding member of the National Sailing Hall of Fame. Established in 1907 on the Barnegat Bay in New Jersey, MYC is home to ten sailing Olympians and one Yachtswoman of the Year. The club also boasts several members involved in designing and sailing America’s Cup boats. MYC appreciates the opportunity to be included in this historic effort to honor great American sailors. In 1952 Dr. Britton Chance, with his crew of Edgar P. E. White, Sumner W. White III and Michael Schoettle, alternate, won the gold medal in 5.5 meter class in Helsinki, Finland. The other Olympians were Ferdinand P. Schoettle, John Bryant, F. Gardner Cox, Carl Van Duyne, Peter Commette, and Henry Bossett. In the 1968 Olympics the United States was represented by Mantoloking skippers in two out of five Olympic sailing classes. In 1969, 1970, and 1977, Jan O'Malley was recognized as Yachtswoman of the Year. In 1989, Runyon Colie, Jr., was the recipient of the W. Van Alan Clark, Jr. Trophy, which is "presented annually by The United States Yacht Racing Union to the American sailor who best exemplifies the ideals and traditions of good sportsmanship." In 2000, the Carl Van Duyne Sportsmanship Memorial was unveiled at the America's Cup Hall of Fame in Bristol, Rhode Island. Jonathan Wright crewed on three boats that won the America's Cup. Britton Chance, Jr. designed boats that raced for the America's Cup. The Mantoloking Yacht Club has also had many skippers who have won national and international events. Located on Barnegat Bay on the barrier island town of Seaside Park, New Jersey, SPYC was founded in 1899, beginning with a series of Sneak Box races for large cash prizes that evolved into first a Sneak Box owners club and soon afterward the Seaside Park Yacht Club. The Seaside Park Yacht Club (SPYC) owes its birth to Henry J. West of Gloucester, N.J., who inaugurated a series of sneak box races on Barnegat Bay for large cash prizes. The principal contenders in these races were the Life Guards who manned the then "Life Saving Stations," which eventually became the United States Coast Guard stations. the course was the same as the present SPYC Course, except perhaps that it was longer, from the Public Dock to Westray's Point to the Drawbridge to the Public Dock, four times around. As a result of these races it was often suggested by the Captains that an Association of Sneak Box Owners be formed and that a club house be erected at the foot of the Public Dock. These discussions took place in the basement of the Cottage owned by Henry J. West and later by SPYC Commodore Robert Wolstenholme at the corner of 5th Avenue and the Bay. Later that year (1899) a meeting of all the cottage owners and yachtsmen in Seaside Park was held at the home of John Weaver and the Seaside Park Yacht Club was formed. John Weaver was elected the first commodore and the Board of Directors was composed of the leading yachting enthusiasts such as Henry J. West; Harry B. Wyeth; John E. Creth; Dr. George H. Thacher; George S. Gandy and Harvey T. Weber. The club house was built and soon expanded and boating boomed to an unprecedented degree in Seaside Park. As the area developed, the spirit of yacht racing grew and a series of contests between other early clubs: Island Heights, Bay Head, Mantoloking and Lavallette soon began. The older Toms River Yacht Club resurrected the Toms River Challenge Cup, which had been inaugurated in 1871. Barnegat Bay took on a racing fever unsurpassed in the annals of yacht racing. SPYC, with its fleet of famous racing yachts, such as "Tsar"; "Mermaid"; "Lazy Jack"; "Another Old Maid"; "Fran Roy"; "Dorothy," and others, swept everything before it. All along the Atlantic Seaboard, Barnegat Bay became known as the home of the world's fastest catboats. SPYC and other clubs on the Bay have played and continue to play an important role in the development of yacht racing in the United States. Barnegat Bay and SPYC are home to some of the earliest formal yacht racing contests in the nation and all the BBYRA clubs continue to honor that tradition in the annual contests that incorporate the old and the new. The Sewell Cup was presented as a perpetual trophy in 1900 by the then United States Senator from New Jersey, William J. Sewell and is still raced for every year. In later years the Rodman Wanamaker Trophies, the Middleton Cup (1921), the Morgan Cup, Stanger Cup, Wolstenholme Trophy, Doan Cup, Chance Cup, Thatcher Cup (1927) and others were offered. The social features of the club are many. Over the years entertainments provided by the club members were many and varied. Cabarets, dances, card parties, and musical entertainments were staged every Friday and Saturday evening. The social program at Seaside Park and its delightful Club house were so popular in the '30's and '40's that the Seaside Park Yacht Club marina was filled with visiting boats from other Clubs who came for the swing bands and dancing on the deck on Saturday nights. SPYC continues to hold a special place in the hearts of all BBYR sailors who traditionally wrap up the "official" sailing season on the Seaside Park Course on Labor Day weekend. Upholding tradition and creating new traditions on "Race Day" is a glorious finale to a summer well spent racing on the Bay. The mission of the Larchmont Yacht Club is to instill and enhance an interest in yachting and the spirit of sportsmanship in members and their families; Encourage and provide programs for members and their families to promote and support yacht racing in the Corinthian spirit; Support a program of yacht racing events that meets the expectations of members and their families and enhances the reputation of the Club as a prestigious center of yachting and yacht racing; Encourage and provide compatible leisure and sporting activities, including intra- and interclub competitions; Provide an active and enjoyable family-oriented social environment which members and their families will support, and in which they can participate, with pride and enthusiasm. The Board of Trustees of the Larchmont Yacht Club voted to become a Founding Member of the National Sailing Hall of Fame in Annapolis, Maryland. Larchmont Yacht Club joins other prestigious yacht clubs in the United States in supporting the National Sailing Hall of Fame as it moves forward to construct new facilities in Annapolis, where it is destined to become "a home for the Sport of Sailing" in the United States. When the Larchmont Yacht Club was founded, in 1880, the United States had been a nation for 104 years. Its total population was 50 million. The Civil War had ended 14 years earlier. The village of New Rochelle was settled in 1688; Mamaroneck, as part of Rye, had also long been existence; but in between these two, there was no Larchmont. The story of the origin of the Larchmont Yacht Club has often been told. In the early evening of Memorial Day in the year 1880, five young men were warming themselves over a bonfire built in a cleft of rocks on the shore of what is now Horseshoe Harbor, in Larchmont Manor. These five loved boats and they had just finished a hard racing day. Since a bonfire is scarcely the most comfortable way to close a hard day at sea, it is not surprising that these young men fell to discussing the possibility of organizing a yacht club. They were Frank L. Anthony, Fred W. Flint, William C. France, Loring Lothrop and Charles E. Jenkins. Their boats were part of a small mixed fleet of jib and mainsail sandbaggers, sloops and cat boats moored in Horseshoe Harbor. It was decided that evening to organize a yacht club to be called the Larchmont Yacht Club and to invite others to join. The problem of a Clubhouse was resolved quickly. Fred Flint was elected a committee of one to approach his father, T.J.S. Flint, who was President of the Larchmont Manor Company and owned most of the property in Larchmont Manor from the Post Road south to the shore line. On this property was the small Union Church. The young charter members made a deal with the elder Mr. Flint for the use of the church as a clubhouse and signed a lease for $1.00 per annum. However, it was made clear that the newly formed Club would have use of the church every day except Sunday when the clubhouse would be opened to them only after church services were over. The club membership grew so fast, however, that a larger clubhouse was soon needed, and in the fall of 1881 the club leased the Fleming residence near the church for the annual rental of $1,500 per year. The club continued to expand so it became necessary in 1884, to lease the Shepard House. Three years later, in 1887, the year of the incorporation of the Larchmont Yacht Club, the present site of eleven acres was purchased at a cost of $10,000 from Benjamin A. Carver, a railroad magnate. The original Carver residence was much smaller than the present clubhouse – the east and west wings having been added subsequently to the purchase. The Pandemonium was built fifteen year later in 1902. Our present Junior Clubhouse was the Carver stable and the basement was the cow barn while the first floor housed the horses. Thus, the origin of the Larchmont Yacht Club. Perched on the Western shore of Galveston Bay, the Houston Yacht Club (HYC) is the oldest yacht club in Texas. With a reputation for excellence in race management, HYC hosts two or three regional, national or international regattas a year. In 1897 , after a summer filled with boating excursions, sailing parties and two hotly contested regattas, a group of yachtsmen organized what is today the oldest yacht club in Texas, the Houston Yacht Club (HYC). Dan E. Kennedy, a former Texas Ranger, was elected the first commodore at a meeting held in the Binz Building, Houston’s first skyscraper, on February 2, 1898.
boat, the Lawrence to the Club to promote interest in Houston’s fledgling ship channel and Galveston Bay’s commercial and recreational potential. After two years the Club reorganized as the Houston Launch Club. The Launch Club, with its impressive fleet of motor cruisers, continued to meet downtown until 1910, when they built a club house on Buffalo Bayou in Harrisburg (now part of Houston’s East End) opposite Brady Island and today's Port of Houston turning basin. In addition to encouraging and organizing sailing, power boating, and canoeing events, promoting the development of the ship channel and Houston as a deep water port continued to be a primary focus of the Club. In 1926, the two groups began selling their respective properties and pooling resources to build the Shoreacres clubhouse. Retaining the Houston Yacht Club name and the burgee of the Houston Launch Club, they moved into their “magnificent and commodious” Spanish building in July of 1927. This three story stucco building, affectionately referred to as the “Pink Palace,” has provided a warm home on the Bay for member families for almost 75 years. During World War II, the clubhouse was occupied by the U.S. Coast Guard, which converted it into a training facility. As in World War I, members and their boats went to war. Their power boats were used to help patrol the Houston Ship Channel, a vital oil port. From its landmark home on upper Galveston Bay, HYC continues a long established tradition of organizing regattas, hosting national and world championships, and promoting Houston as a nationally recognized yacht racing and recreational boating center. Click here for additional history, including a list of HYC's commodores through the years. Named after Sir Thomas Lipton, the British tea magnate who launched five unsuccessful bids for the America's Cup, the Lipton Regattas are a unique story about the beginnings of affordable one-design yacht racing in the Gulf Coast. HYC played host to the Lipton Regattas in 1929 and 1941. Click here for the story of the Lipton Regattas and the Gulf Yachting Association.